The Appalachian Trail Day Hikers' Guide: Downhill to Fine Wine and Accommodations: Georgia, North Carolina and Tennessee by Carol and Jim Steiner features Trail Maps and Elevation Profiles, Detailed Directions to Trailheads with GPS- Coordinates, Level of Effort ratings, Hike Times, Distances, and Downhill Miles, Descriptions of what you will find along the Trail, Lodging, Restaurants, Outfitters, Shuttle-Service Providers, Groceries, ATMs, Urgent Care and Emergency Services and Fun Places to Visit in nearby towns. We asked Carol why she and Jim wrote this guide book. We then asked her why the Appalachian Trail is important. The Appalachian Trail Day Hikers' Guide: Downhill to Fine Wine and Accommodations: Georgia, North Carolina and Tennessee by Carol and Jim Steiner includes stories from Carol’s hiking journals, amazing pictures from their own hikes and amusing accounts of their occasional mishaps on the trail. 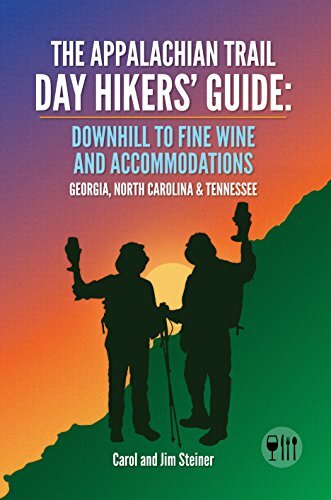 We thoroughly enjoyed The Appalachian Trail Day Hikers' Guide: Downhill to Fine Wine and Accommodations: Georgia, North Carolina and Tennessee by Carol and Jim Steiner. If we decide to enjoy an Appalachian Trail adventure on our next trip to the Smoky Mountains, this book will definitely be right there guiding the way.